James Mulcrone (often referred to as McCrone), was born in 1868 and reared near Abbeyshrule in the parish of Carrickedmond, Baron of Shrule, Co Longford. He was a machine-worker with the Great Southern Railway (GSR) for a great part of his life after some early years in Africa (Boer War) and then some time in Glasgow. According to my father Tom, he was a very tall, thin and elegant man who had a 'big walrus moustache' and rode an 'upstairs model ' push-bike. He was married, had a lovely wife, no children and was a 'home bird'. Mulcrone was always impeccably dressed and according to Séamus Ennis's sister Ursula, he was always telling Séamus how to conduct himself. He used to call him " a mac" (sic). He was very interested in gardening and used to help the Ennis's out in their garden in Jamestown Road in Finglas. He had a bad shake in one hand in later life, which was probably due to Parkinson's disease. He fought in the * Boer War (1899 – 1902) in South Africa. As a result of his time there he developed a hatred for jam, as it was all he had to eat for many weeks during the war and couldn't bear the sight of it! My father Tom, often told the story of how Mulcrone captured and took a Boer prisoner. The two of them took refuge one night in a hole in the desert and when Mulcrone awoke the following morning both the Boer and Mulcrone's rifle were gone! "And sure wasn't he the decent Boer that didn't shoot me" he used to say in conclusion! He lived in 40 St. Peter's Road, Phibsborough, Dublin (road adjacent to Cabra Park). It was a calling house for many pipers including Tom Mulligan, Séamus Ennis, Tommy Reck and also the likes of John Cawley the flute-player who worked as a cook in Mountjoy jail. New sets and sets in for repair were generally passed around the piping company to play or comment upon. Séamus Ennis would often test sets of pipes for correctness in tuning. My father Tom used recall Ennis calling for the 'rat-tailed file' or 'beeswax' for minor surgery on occasion! Generally, Sunday morning after mass was a popular such occasion and the visiting musicians would generally retire to the Cushion Doyles' at Doyle's Corner, after the 'after mass visit'. Mulcrone played the pipes himself. He had two lathes one of which I was told ended up in Matt Kiernan's workshop. It was said that Matt got a lot of his pipe-making equipment. A favourite pass-time of Mulcrones was making spinning tops for kids on his lathe. He must have had an interest in fiddles also as my father Tom bought an Ole Bull (b. Bergen, Norway 1810, one of 10 children, d. 1880) fiddle off him which he enjoyed playing and was very attached to. He made a C# set of pipes for Tom Mulligan in 1938, for which Tom payed him a weekly installment of 10 shillings. Tom played them for years right up to the early seventies. Tommy Reck used to borrow them for periods in the 1940s and 1950s as they were louder than his own B set. Indeed, both men could play pipes and fiddle and would often swop instruments during a session. This set can be heard on the CDs Barr na Cúille and The Leitrim Thrush. The only other sets that I know of are a set in C which were played originally by my brother Gerry, and now played by another brother Alphie. The other set was one in C played by a beautiful piper called Peadar Broe who was from the Iona area of Glasnevin and who died about 1972. He is buried in Fermoy in Co. Cork where he had bought a farm after retiring from the army. 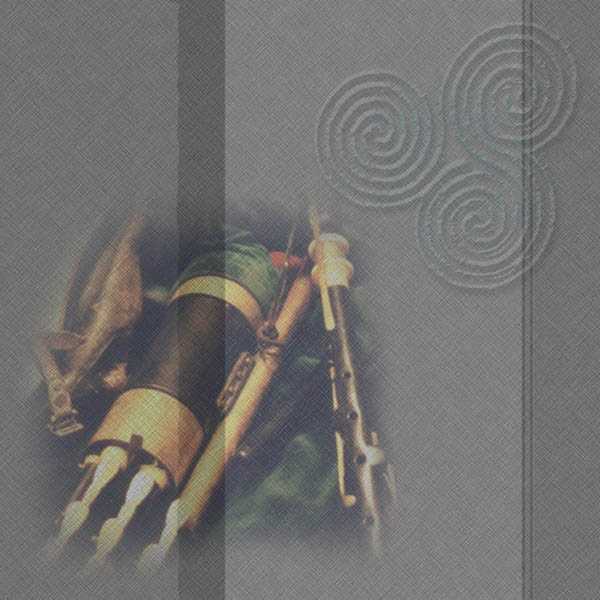 The only commercial recording of Peadar playing these pipes can be heard on the album "The Drones and the Chanter" where he plays a lullaby. "In Loving Memory of Maria Dolan Nee Mulcronn (sic) Died 14th January 1962 Aged 83 Yrs Her husband Joe died 18th Dec.1977 Aged 99 years Interred in Carrickedmond"
Mulcrone had a nephew called Packie Dolan (his mother was James's sister) who lived in Long Avenue, near Abbeyshrule and also played the pipes. I had the pleasure of meeting this lovely man on two occasions at his house where we played pipes together for many hours and had some great conversations with him. He also showed me Mulcrone's grave where he is buried beside the old monastery in Abbeyshrule. It was there that I discovered that his name was in fact Mulcrone, although everyone I had met who mentioned him called him 'McCrone'. Packie himself died some years ago. My father used to quote Mulcrone's satisfaction on hearing his set of pipes being tuned up, and referring to the sound of the drones would say: "Ah sure they're like a hive of bees buzzing" he would contentedly conclude. Many thanks to Ríonach Uí Ógáin, Cumann Béaloideas Éireann, for permission to use extracts from Séamus Ennis's interview with James Mulcrone in 1942. 1940,s in Abbeyshrule. He was an acquaintance of my father. As far as I can recall he was related to the famous Dolan family , all pipers , who lived on the "Long Avenue" . I also knew Seamus Ennis well in his latter life . I live in Balbriggan. Seamus spent his last years in uncomfortable circumstances in nearby Naul. I tried to assist him in a few material matters. He recounted once to me that he knew Mulchrone. One small matter that sticks fondly in my mind about Mulchrone ! As a nipper I was a Huckleberry Finn character immersed in fishing on the Inny. At one point Jim Mulchrone donated me his fishing rod at a time immediately after the war when a rod was a rare and valuable commodity. You might like to visit the site that I administer for the Abbeyshrule area. You can access it as follows www.abbeyshrule.com. I am developing it ( slowly ) and will try to include a section on traditional Irish music at some time soon.